Have you ever seen the Summer Triangle? 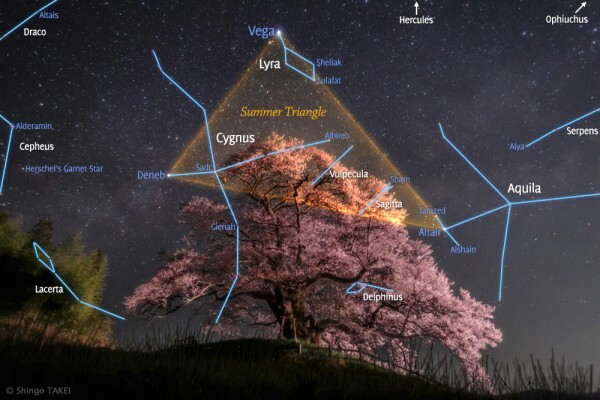 The bright stars Vega, Deneb, and Altair form a large triangle on the sky that can be seen rising in the early northern early spring during the morning and rising in the northern fall during the evening. During summer months, the triangle can be found nearly overhead near midnight. Featured here, the Summer Triangle asterism was captured last month from Gunma, Japan. In the foreground, sporting a triangular shape of its own, is a flowering 500 year old cherry tree, standing about 15 meters tall. The triangular shape of the asterism is only evident from the direction of Earth — in actuality the stars are thousands of light years apart in space.